Who doesn't want to snuggle up with bacon? It's delicious and comforting. It's completely logical in our humble opinion! And we're pretty sure your sweetie would enjoy it too. And on this holiday, that's the point right? In this bundle you've got the ingredients for a bountiful breakfast in bed, with chocolate chip pancakes, some bacon and ham, and maple bacon coffee. You'll have your Valentine wanting to spend all day in bed. And with two packs of bacon, coffee, and chocolate chip pancakes, you've got some serious provisions to keep you fortified. After all, man can not live on love alone. Unless, perhaps that love is bacon. There's really no need to go anywhere when you've got gourmet bacon at hand. It's all you need to "Wow" and "Woo" your Valentine. So instead of going to some stuffy, crowded and over-priced restaurant, treat your self & your loved one to a delicious breakfast in bed. Or even dinner. Bacon and pancakes don't need to be limited to only breakfast. Spike the coffee and crank up the music. Now, we're talkin'! 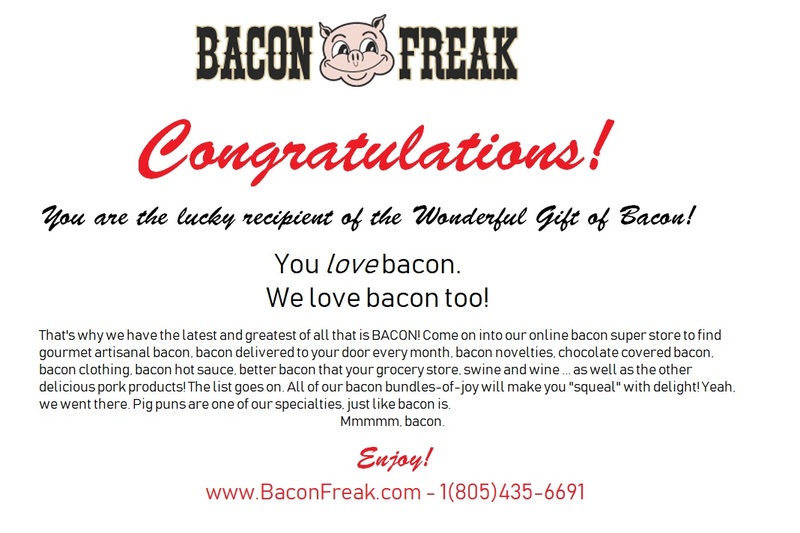 Bacon Freak Hickory Smoked Bacon - 16 oz. Orville's Apple Pie Bacon - 16 oz. Mountain Smokehouse Bone-in Ham Steak - 16 oz. Boss Hog Maple Bacon Coffee - 8 oz. Bacon Freak Chocolate Chip Pancake Mix - 12 oz.